Niamh began her Championship Show career by winning Best Puppy in Show. She is a daughter of our Gabriella and the French VA male Nielsen du Normont, who now resides with us. 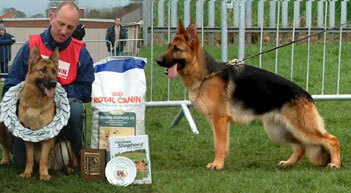 Niamh was the Joint Top Puppy 2003 and took the title of Young Siegerin at the Irish Sieger Show in 2004. She won her Res CC under Meg Purnell Carpenter at Birmingham, her 2nd under Pauline Cullen at SKC & her Reserve Green Star under Dave Spence in Southern Ireland. Niamh is of the correct size and strength, is firm and dry throughout with correct hock, firm in movement. Very sire typical with very good pigmentation and most importantly of all, an excellent outgoing temperament. Niamh is also in training for her working qualifications.